Canine Aggression Issues with Jim Crosby: FEAR. Today while spinning around the Internet I came across the following picture on colleague Jean Donaldson's blog. I have never had the pleasure of meeting Jean but respect her work. Talk about nailing it. To be clear-this is not my photo. 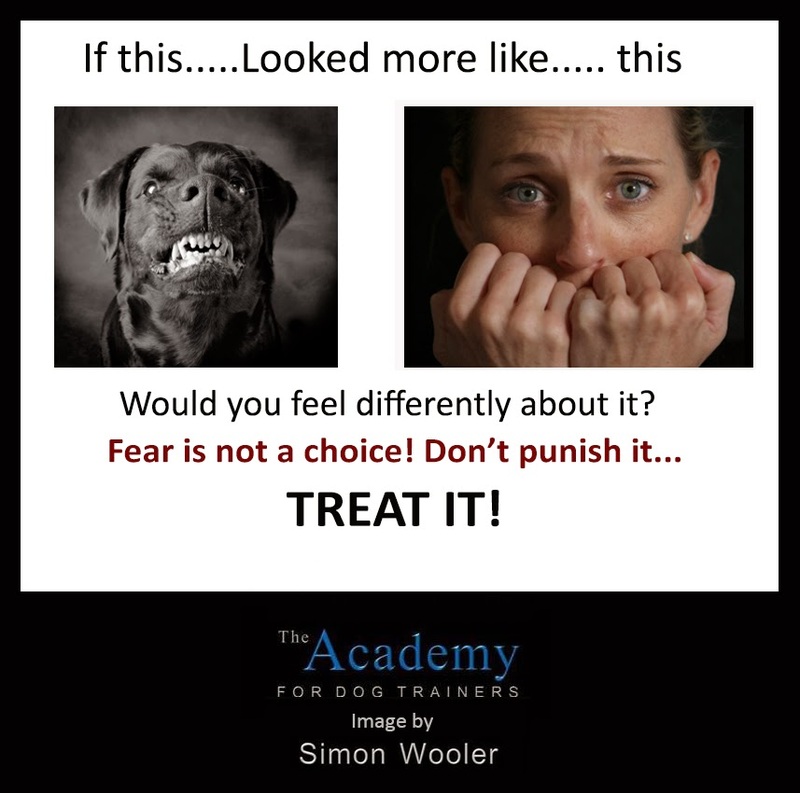 It is from Jean's blog for The Dog Training Academy and is by Simon Wooler, as noted above. The credit is all theirs. But the underlying principal is a very strong one. Too often owners and others mistake a fearful reaction for dangerous aggression. They fail to recognize fear can lead to pushing a dog past its ability to handle fear, and too often results in a tragic circumstance for the dog and the human. So I want to look at fear, aggression, and the way we regard them both for a few minutes here. Lots of my cases involve bites by dogs. Some of them are so bad that the human dies. Often the dog also dies, for one reason or another. Those that survive are mostly labelled "Dangerous" and face sanctions and restrictions for life. The fact that the dog bit a person in my cases is pretty much established (except in a few my regular readers know about: see Phineas in Missouri). Too often that is where the investigation, if there is one, stops. I have only rarely run into others that want to know "Why?". Why did the dog bite? Was the bite deliberate or an accident? What was the set of circumstance that led to the final outcome? What did the dog see or feel that led him to resort to a bite? If a dog bites there is a reason for it. Dog's do not just "snap", unless they are critically mentally ill, just like humans. Or maybe even less often than humans. They tend to be saner that we are, overall, and usually more tolerant. In my experience with bites and dangerous dogs I have to say that fear, in one form or another, is the largest contributor to bite behavior. We may dress it up by calling it "lack of socialization" or "situational anxiety", or worse "dominance", but the bottom line is that it is fear. The same fear that makes us uncomfortable walking down a dark street alone. The same fear that sends us running when a big spider is on the table. The same fear that keeps some off of airplanes, or off bridges, or out of elevators. Sometimes, like a fear of jumping out of a perfectly good airplane with a bed sheet tied to your back (a behavior that many enjoy but not me: I want to ride in the plane ALL THE WAY to the landing spot) is solidly grounded. Or the fear that a reasonable person would have when bullets start flying around. But dogs only have their own limited worldview and experience to work with, and don't seem to have quite all the higher cognitive powers we grant ourselves. They live through experience. Dogs, unfortunately, don't always speak human. They speak dog. And what a human says may not be the same as what a dog understands. Communication requires two things: transmission of a clear message, not overcome by noise, and reception of that message. Both the sender and the receiver have to share the same language so they both interpret the message the same way. There are also nuances in transmission that have to be carried through somehow. This is what gets us in trouble with texting some times; we are missing the vocal inflections and body language that clarify the message sent. Try changing the vocal stress on the simple phrase "What do you want me to do" Too much stress on the wrong word and we have gone from cooperation to sarcasm or incredulity. This is worse with dogs. Dogs communicate clearly, but mostly with body language. Dogs can't text (yet). A dog that is fearful can't pick up their phone and tell you what he feels. He/she has body language to revert to-their primary communication channel. If they are transmitting, but the other individual isn't receiving, or isn't paying attention, the communication attempt breaks down. What do we do when we aren't getting through trying to communicate with someone? We tend to first try phrasing the message differently, and then often raise our voices. Dogs go through this too. They try different postures. The growl. They bark. They retreat. And if these tries don't work, they raise their voices-they bite. So back to fear. Bites are too often dogs that have tried to tell us, over and over, that they are afraid of something. We aren't listening. Something has them on edge. They are perceiving something as a possible threat. They want the scary thing to go away. They bite. Then we act like the dog "just snapped" and want to take massive action, dumping the dog or even killing it. We label the dog as "aggressive" and by that label we shrug off any responsibility for ourselves. But labeling a dog "aggressive" doesn't solve anything. Aggression is not a disease to be cured, nor is it a genetically determined quality that is innately there. Aggression is simply one behavior strategy for a dog to manipulate its environment or to secure its safety. Fear creates a situation that the dog perceives as a threat to its safety. In cases I am currently working fear is clearly the operative factor. Strangers (lately wearing police uniforms) enter a property for reasons often unrelated to the dog. The officer comes across the dog. The dog is a bit protective of his/her territory and tries to warn the intruder to back off. The intruder has a separate mission that must be completed and the dog does not understand. The intruder continues on and the dog becomes fearful of the intruder. The dog escalates signals and the intruder does not/can not back off. Perhaps at this point the officer is fearful himself and sees the dog's behavior as a threat, not a reaction to fear. If the officer has not been given the tools and training to deescalate the encounter, the next thing that happens in lead starts flying. The bullets usually kill the dog, although these encounters also result in the injury, and sometimes death, of humans. Sometimes that is even the death of another police officer. Or a child. Once lead starts flying everyone is at risk. How do we make life safer for our families, ourselves, and our dogs? First, learn to look for the fear. Recognize it in your dog. The fear that lies under the bluffing and posturing. If the fear is showing in your dog, treat it. If you are likely to encounter fear in a dog that you have no control over, then learn to recognize and reduce the fear generated in your contact. Learn what you can do to smooth the contact. Give the dog options if possible. Give the dog a way out. Give the dog room. Send signals that you don't want to fight and that you are not a threat. Use that big grey ting on top of your shoulders as your best tool. Sometimes the mission is more time critical, but don't let urgency or emergency get confused with convenience. Remember that fear is not rational. For a human we insist that a massive response must be reasonable and not based in particular, personal sensitivities. As a police officer I had to deal with people doing stupid things in high places, like trying to jump off buildings or who crashed cars at the top of tall bridges (the Florida equivalent of cliffs and mountains). The fact that I am still not quite comfy on high, exposed places made no difference. I had to do my job, even two hundred feet over a river looking down through a metal grate. Civilians can choose to avoid personally scary things. Police and firefighters cannot-we have to carry on. So if we are afraid of something, dogs included, well...tough tomatoes. Get over it or find another job. The excuse that a police officer was "afraid for their lives" must be held to an objective standard, and as ready as I am to defend a police officer doing her job, too many cases are not reaching that standard. If you are in a position to encounter dogs, especially in stressful circumstances, it is incumbent on you to learn the difference between a reasonable threat and an unreasonable use of deadly force. The fear that a professional uses to justify action must be rational and reasonable. Fear in humans is recognizable to us. So is fear in dogs. The signals are different in dogs so we must take responsibility to learn those signals. The photo above is so telling: the human is sending fear signals that we comprehend immediately. The dog, not so much. Yet the behavior shown is just as clear if we know what to look for. Start looking. Start thinking. Recognize the signals. Keep everyone safe. We recognize that fear in humans is widespread and manifests in different forms, from withdrawal from scary situations to overt bullying and puffed up behavior. Dogs suffer the same symptoms. Learn to see through the sturm und drang, the drama and bluffing. Don't let your dog's fear be mistaken for viciousness. It's not.